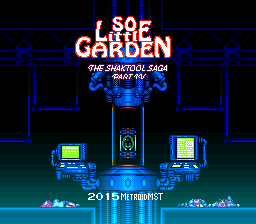 So Little Garden was MetroidMst's entry for the A.N.T.I. 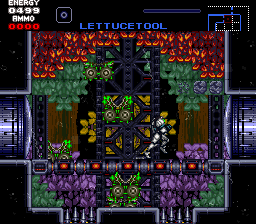 contest held on Metroid Construction. It is relatively small due to limitations in the contest parameters. 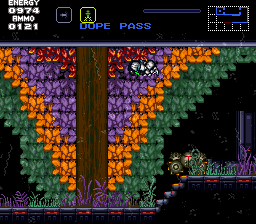 It also features custom music, custom items, custom bosses, and other strange and wonderful things. Difficulty is above average. 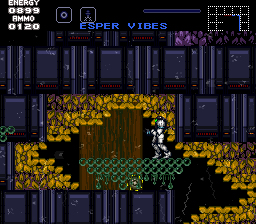 This is a MetroidMst hack, so expect some difficult sections and/or bosses to appear. (v1.0) Possibly one of the best minihacks around, and definitely the best thing MetroidMst has done yet. Manages to find that delicate balance of stupid, unfair, and fun, and yet still doesn't overstay its welcome. 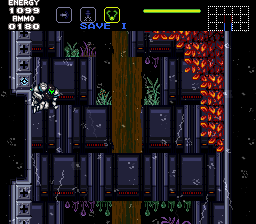 Plenty of cool new things, including bosses, music, HUDs and graphics, and it'd be worth checking out just for that. However Mst manages to also pull off a good hack in the process. I'd almost consider rating this 5 stars, if not for a few bugs about the place that need squashing. I don't care if the map borking is in your story. It's bad. One of the best hacks by Mst. 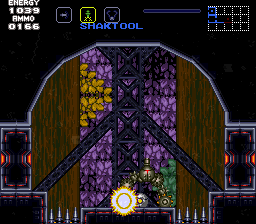 It features many interesting bosses that are all shaktool related in some way or another (except one). However the grapple physics are wonky and racing this hack is a fun, but painful experience. Proper Item Collection display: 100.0%. Conclusion: SLG has a lot of unique and fun features that make it worth playing, but expect some heavy frustration the further you go. I LOVE this hack. Along with Hyper Metroid, it's tied for my favorite hack ever, and it's funny how I like both because the two hacks are about as opposite as you can get in a lot of ways. I also find the other reviews a bit puzzling and I think unfairly hard on this hack. People describe it as "frustrating" and even "unfair", but I'm not getting that. I think this is one of the more accessible hacks, even though it does get genuinely difficult. It seems very carefully designed and never "unfair". Contrast with Eris, a hack I found unnecessarily difficult. This hack is hard, but it has all the types of challenges I like without the ones I don't. I'll list my pros and cons and that'll make clear just how much I like this hack. * This game is marked "veteran" in terms of difficulty level but I find that it is much more accessible because the difficulty level ramps up gradually. There are some genuinely tricky points, but I find that it starts out very easy, and it gives you ample opportunity to develop the skills necessary to get through the tougher points. 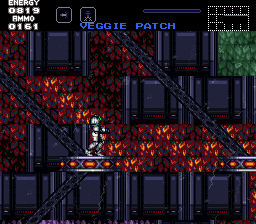 In early areas, enemies don't do too much damage, and they do more as the game progresses. It felt natural to me...I became more challenged as I went through the hack, and although it got up to a pretty advanced level, it felt like it took me there on a gentle slope. Save-stations are conspicuously and conveniently placed before boss fights. Nothing ever felt like it was wasting my time or toying with me; rather it felt like this hack was genuinely challenging me the way I wanted to be challenged. * All new music and I love it. Not only does the main area have new music, but there is quite a lot of new music in the boss fights, and it's really great music too. * I know some people list this as a con but I LOVE the removal of wall-jumping and bomb-jumping. I think wall-jumping is often abused by more advanced players to the point that it makes the game less fun...and this game throws a wrench in that. Maybe people complain about this game being frustrating because they've basically developed wall-jumping and IBJ to the point of breaking the intent of the original game...this game kinda restores it in a sense, and it felt more like the sort of exciting process of playing Metroid for the first time. * Secrets are just brilliant. Some items are out in the open, some items are hidden with obvious hints, others are hidden in new and creative ways, and there are some really tricky things, utilizing new game dynamics, to get some of them. It's a great balance. And I still haven't found a large portion of the secrets...it's like there's a lot more to explore even though I've finished it. * Some opportunity for sequence breaking using advanced techniques (including at least one trick specific to this hack.) This gives this hack rich potential for speedrunning. * Long and rich for a mini-hack. I know it's marketed as "relatively small", but it is big enough to make it feel like a real adventure. And it's a relatively full hack in the sense of using a wide range of items in the game. * Some substantial changes to items and game dynamics. The rocket ball is such a unique idea, and synergizes beautifully with the removal of wall jumping and bomb jumping, and the different behavior of the ice beam is interesting, especially how you need to utilize it in different ways to get items and even get through the basic game progression. I love the changing of the space jump to a single-use boost. I also like the physics of double-jumping...it plays very nicely and the rooms are impeccably designed to fit with the physics. * A lot of the really hard stuff, like some of the really difficult grapple-beam parts, is neatly compartmentalized so as not to be necessary, i.e. it's mostly to get optional missles, and you only need to do it once. Although you need to traverse certain areas of the map many times, there is nothing tedious or difficult about the retraced routes (*cough* unlike Eris *cough*) and the difficult acrobatics are mostly compartmentalized into one-time-only things. * Enemy placement and behavior makes you think, much more than the original game. 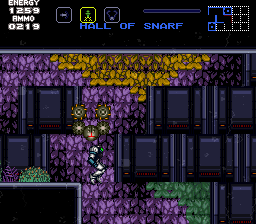 The enemies are pretty simple, for the most part, but they're used in clever ways that can throw you for a loop. 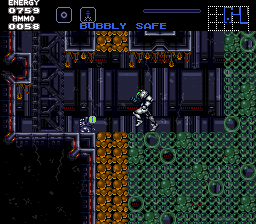 Because some common enemies are pretty tanky, but easily killed by missles, I also needed to switch between missles and beams more frequently in this than in the original, and I liked that. * I love the silly area names, and the general silly vibe. This game never seemed to take itself too seriously and that made it even more fun to play. * Boss inovation! Rather than just replaying the same bosses with minor tweaks, this game creates totally new boss fights. Some of them are pretty simple, and some of them are more interesting than others, but the experience is novel. The game ends with a familiar boss used in a very novel way -- one that forced me to adjust my usual strategy and die several times before I got it. * The map is hard to read; it makes it hard to see where you've been and where you haven't. And then there's the map bug; just use savestates if you want to save. 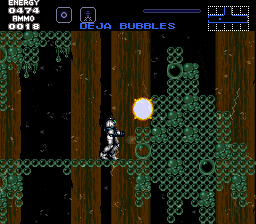 * Several bosses you kill, but there is only a weak signal that you've progressed...i.e. the rinkas keep coming and a door opens (which might be off-screen.) This could have been better executed...maybe a change of music, stop the rinkas? I don't know. It felt anticlimactic. * I wish every hack were this good. And do wish this hack were a little bit bigger. This hack really highlights all the things I want other hacks to do more of: new music, new bosses, new look-and-feel, natural progression of difficulty, change to game physics. * Screw attack (which you can get pretty early with a minor sequence-breaking trick) makes all bosses except the last one too easy. I think this game would be improved by either making the screw attack defense-only, or making the bosses immune to it. But these are small concerns. Overall, this hack is pretty much golden. But I realy enjoyed it! Bring me more custom musics and custom enemies!